As the old maxim goes, time is money. When it comes to equipment, operating time is certainly money – but the machine must be running and working to bring that money in. When we are faced with a down market, such as the situation in Alberta and to some extent throughout the construction industry, the maxim becomes no work equals no money. That is a difficult situation to face for owners who have invested plenty of funds into their equipment. A new approach to equipment rental is offering opportunities to get that equipment back to work and earning money faster. It’s a very different way of renting equipment that its proponents hope will lead to more uptime for machinery and other items that might otherwise be sitting on the lot waiting for the next job to come along. Traditionally, rentals are managed through a rental house – the contractor stops in, picks up the machine from the rental house’s on-site fleet, and carries on. That can be pricey in the long run, though – Skiba knows that from experience. Finding a cost savings while also finding the right piece of equipment at the right time was a challenge. However, after experiencing some peer-to-peer service, Skiba came up with a new approach to equipment rentals. That’s where the concept of AnyQuip came from. It is a system that bypasses the rental houses and puts rentals into the hands of the equipment owner and renter themselves. Instead, AnyQuip provides an online marketplace that offers owners a place to advertise their equipment and renters a place to pick up what they need without having to deal with the rental house. Much like Uber or Airbnb, it is designed to give a snapshot of the equipment that gives potential renters an idea of what the machine looks like and its level of maintenance. 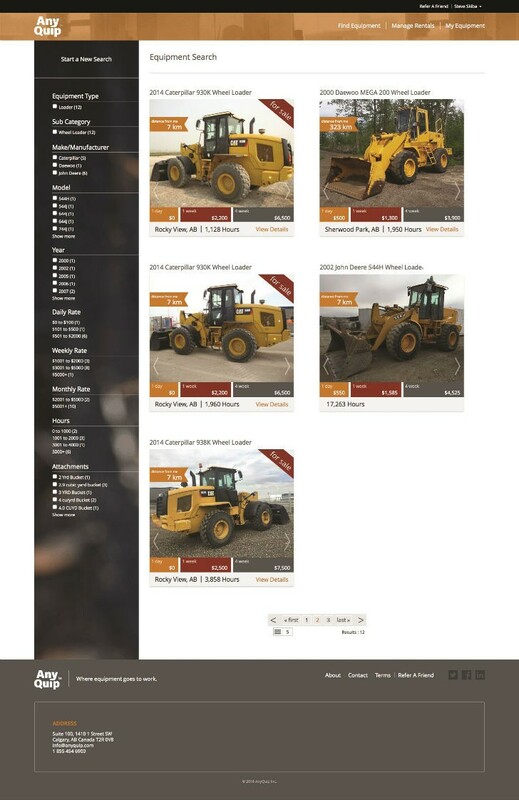 The website provides a list of products available, along with a price, notes on whether transportation or operators are available, and numerous other factors regarding the piece of equipment being rented out. Once a potential renter – who is also vetted – is on the site, AnyQuip helps make those connections by providing the necessary contracts, prompts for mandatory insurance certificates, payment processing and detailed pre- and post-inspections, while taking a small fee on each successful rental. The renter is required to treat the machine just as they would their own – and are rated poorly if they don’t. All activity and communications, including all inspection data is saved on the site and protects both owner and renter in the case of any disputes that may arise. AnyQuip also works with the renters to ensure they have everything they need to keep the machines working well. “If you don’t have a maintenance truck, we’ll get one for you. If you don’t have a fuel truck, we’ll get that too. If you don’t want to transport it, we’ll get that,” Skiba said. The result is a generally lower rental cost, and a higher utilization for that piece of equipment. AnyQuip recently launched in Alberta, initially targeting both the construction and oil and gas markets that use plenty of different types of equipment, from light towers and generators to large excavators. It has begun to expand into Saskatchewan and southern British Columbia, with the hope of going even further in all industries where heavy equipment works once it has established itself as a good rental option, Skiba said. “We probably have more rental requests than we do equipment. We’re getting a lot of questions, but we aren’t getting pushback – guys realize that if they don’t start moving this equipment, they won’t be in business,” he said. It’s likely that rental will have an even greater role in the future, Skiba suggested.